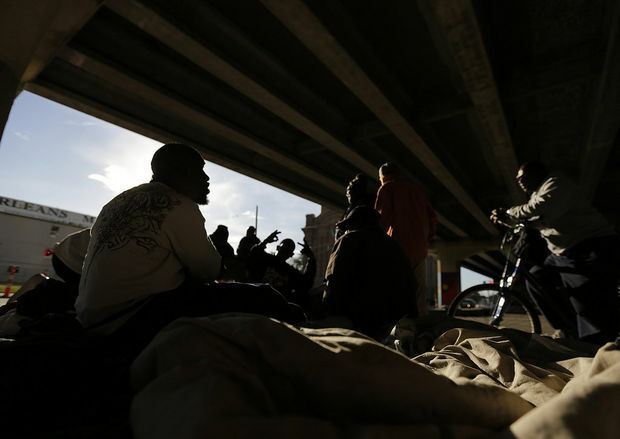 Like many of you, I have been reading about the coming forced evacuations of the 120 plus homeless people who currently reside nightly underneath the Pontchartrain Expressway in downtown New Orleans. City officials began handing out 72 hour notices on Monday evening, citing health violations, safety concerns and drug use as parts of the problem which are necessitating this move. Outreach workers will be on hand to help steer people into the shelters, where resources and case management will be made available to assist people in finding more suitable, long term housing. Sounds like a win-win on its surface: resources made available for people who need it and the city doesn’t have to worry about a growing health and safety problem…but you just know it’s not that simple. People aren’t that simple, much as we might want them to be. So then, why might somebody choose the streets of New Orleans, choose to live under an overpass instead of a shelter with resources? 1. Shelters have rules and curfews. Oftentimes, dismissive types claim homeless people don’t like shelters because the curfews and rules prevent people with addictions from getting drunk or high. And for some, that may very well be a part of it but that’s not the whole story. First off, not all homeless people are addicted to substances. Second, people also bristle at curfews and rules because homelessness doesn’t suddenly instill in people the desire to give up their freedoms. They are adults, and most adults don’t want to answer to strangers, be told what to do, when to eat, where and when to sleep, what time to be at the shelter and when it is too late for them to leave, or lose their bed. A loss of so many freedoms most of us take for granted can be a pretty demeaning feeling in an already often demeaning situation, feeling less than, stigmatized, not in control of your own situation…out on the streets, there’s still an element of control, of making independent choices most adults I know would be loathe to give up. Can’t sleep and want to go for a walk, have a smoke, make a phone call? Curfews and rules might say nope. 2. The men and women who live under the overpass have formed a community, one that could be broken up in a shelter. No communities are perfect and some can be dangerous and certainly, with assaults and sexual exploitation that have been documented under the Pontchartrain Expressway, this community has its dangers, but it is a community. People there look out for each other, know each other, know when someone’s not doing well and sometimes even care for one another. That’s what people do. To many, this community is a known and it’s voluntary inasmuch as there is a choice on whether or not to be in that community. There are understandings there, and to go into the shelters is to give this up and put yourself at the mercy of the unknown. There may be someone in the shelter somebody has a past with, somebody that makes another feel threatened or unsafe. It can be a very hard choice. 3. What about their belongings? Most shelters, due to space restrictions, have set limits on how many belongings you can bring through their door. When you’re homeless, oftentimes the stuff you have with you is what you have left of your present and former identity. On the streets, there are no restrictions upon how much you can bring with you and to be told by strangers what is necessary for you to have and what is expendable, that anything outside of two bags is superfluous and to be told you need to go through your possessions and decide what to keep and what to throw away is extraordinarily difficult for anyone who has already lost so much. 4. In the shelters there may be issues with staff treatment. Let me say first that I can only believe the vast majority of people who work in the shelters do so because they care, because they really want to help and work very hard, but having myself worked in shelters it is a fact not everyone is like this. There are predators. There are abusive staff. In San Francisco, staff like this were called “jailers.” They exist, and they can do a number of things to shelter residents. Curse them out. Kick them out arbitrarily. Coerce favors for perks at the shelter…use your imagination. It isn’t a regular occurrence I’m sure, but it happens. And if you are a shelter resident it happens to, it can be extraordinarily damaging. 5. The shelters have time limits, and many of those time limits are short. Three weeks at the New Orleans Mission. Ten days at Ozanam. That is not enough time to fix the kind of problems that lead to homelessness. Now, at some shelters, people do have options for more time, up to a year if they are in mental health or substance abuse programs and for some that may be precisely what they need to right what needs righting, but not everybody is ready to accept that kind of help. Not everyone thinks they have a substance abuse problem and many with mental health issues may dislike the stigma that comes with treatment, adding to the stigma of being homeless or they may not think they need treatment at all, have a lack of insight or be against medications. Mental health and substance addiction are very complex issues and when combined they can be that much more so. And with these time limits, where do people go when they time out? Back to the shadows of the overpass? Maybe to a different neighborhood or city, or to jail? 6. Many of these shelters charge nightly, some upwards of ten dollars a night. One can go to various churches and get fee waivers, but it’s difficult to cart your belongings from one place to another to get a waiver, then back to the shelter at night and in the morning, have to leave the shelter all day, still carrying belongings. It’s more loss of autonomy and more answering to others. Either that or you can pay the ten dollars a night, money many don’t have so they are then forced to panhandle to get. With all of this, it can be easier, freer, more autonomous and independent to stake out a spot on the streets and just stay there. Not ideal obviously, but for some it can seem a better choice. Now, as a social worker for the past twenty plus years I do feel that some of the people who are forced out of the homeless encampment will get a chance to do something different, maybe get treatment or mental health help, maybe even housing and that is certainly a win for them, especially in the long run but I also feel some won’t be ready for these steps. Some have been on the streets so long to try to acculturate themselves back into a life away can be difficult. Mental illness can make it more difficult. Mental illness and addiction, even more so. Some just won’t be ready. It should seem obvious the people living under the expressway are doing so for a reason. You may not understand what those reasons are or even disagree with them, but that makes these reasons no less real or valid. Rather than kicking them out, why not continue to provide outreach, outreach, outreach while helping them to be safe, right where they are until that outreach leads to a home, or until they are ready to face any problems they might have. If there are public health issues, clean it up, or provide incentive for the people staying there to clean it up themselves. Provide waste disposal, port-a-lets, whatever’s necessary. Bring the solutions to them and put in the time to make it work, take hold for real. If worried this might lead to people never wanting to leave, find out exactly why it is they want to live under an overpass rather than their own home and work towards solutions to these wants. Find the bigger and better deal and present it to them. It may cost more, but it sure will be more effective in the long run and isn’t helping people the point of all this? If not, it should be, unless this really is being done because of neighbor complaints, pending Saints games at the Superdome or because some consider their fellow citizens, people, to be eyesores. Rather than the police just forcing them out, possibly traumatizing some and then fencing it all up, there should be a mixture of responses here. This is a community, and for now it has become their home. In social work, there is a oft-quoted phrase: “Meet people where they’re at,” which essentially means to provide the amount of help people are ready to accept and help motivate them over time to accept even more. Forcing them out of their home with a 72 hour notice is not meeting people where they’re at and for some, not the right thing to do at all.